IQS Directory implements a thorough list of sandblast cabinet manufacturers and suppliers. Utilize our listing to examine and sort top sandblast cabinet manufacturers with previews of ads and detailed descriptions of each product. Any sandblast cabinet company can design, engineer, and manufacture sandblast cabinet to meet your companies specific qualifications. An easy connection to reach sandblast cabinet companies through our fast request for quote form is provided on our website. The company information includes website links, company profile, locations, phone, product videos and product information. Customer reviews are available and product specific news articles. This source is right for you whether it's for a manufacturer of sandblasting cabinets, and bead blasting cabinets. Our sandblast cabinets come with a plethora of features. These value-added products are designed with you in mind which is why they are convenient to use and highly reliable. These premium cabinets are energy efficient which means you will save money! Your satisfaction is paramount to our growth. We strive to make our customers our first priority. Let our experts help you today! Give us a call to speak with one of our representatives. Founded in 1991, Midwest Finishing Systems is an ISO 9001-2000 company that strives for friendly service, complete customer support and highest level of product knowledge. They offer an extensive line of products and equipment from a network of quality manufacturers, including sandblast cabinets, to make sure all of your metal finishing needs can be met. For the past fifty years, Great Lakes Finishing Equipment has been specializing in the distribution of metal finishing equipment and supplies. Not only do they supply customers with quality equipment from the best manufacturers, they have an in-house job shop that can finish products for you. For all sandblast cabinets, and other blasting needs, be sure to call today. 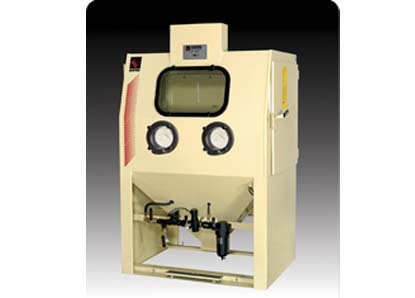 Sandblast cabinets are enclosures in which media blasting processes are conducted. A given sandblast cabinet can vary in size, but the word “cabinet” implies a degree of compactness. 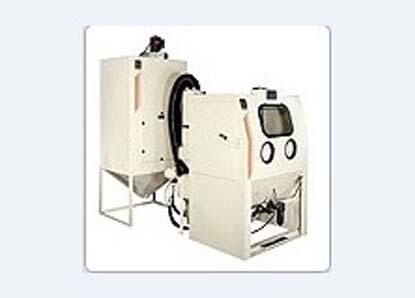 Most sandblast cabinets feature a blasting enclosure, and the enclosure usually contains either a combination of stationary blasting jets and a blasting table or a handheld blasting nozzle that can be accessed through a built-in, protected handling system. Many sandblast cabinets feature durable glass or plastic paneling that allows for easy monitoring of blasting progress while preventing the unwanted spread of blasting media. Large blasting cabinets can be automated, and such systems are particularly valuable in large-scale treatment operations because of the minimum of technical supervision required to operate them. Companies with dedicated media blasting services make frequent, and in some cases exclusive, use of sandblast cabinets in surface treatment operations. The extent of the benefits offered by enclosed blasting areas cannot be measured. In terms of cost-effectiveness, environmental-friendliness and the maintenance of safe workspaces, the introduction of blasting cabinets was a major development for the media blasting industry. Media blasting, depending on the variety of media used, can contaminate air with large volumes of blasting dust. Depending on the composition of the dust, it can pose serious health risks to people who are regularly exposed to it. The debilitating, incurable lung disease silicosis is caused by prolonged exposure to silica dust, the source of which exposure happens primarily as a result of unsafe sandblasting conditions. Sandblast cabinets effectively capture all dust created by media blasting processes, eliminating risks to workspace air quality (though additional provisions like protective clothing, respirators, air filter systems, and proper ventilation should still be made as precautionary measures). Media blasting is by nature a materials-intensive surface treatment process. Large volumes of blasting media are necessary, especially in large-scale surface treatment operations, and that media has to come from somewhere. Blasting cabinets allow for the reclamation of expelled media. That media can then be cleaned and re-used, reducing the need for new media, which in turn cuts costs and mitigates the negative impact of blast media-related environmental degradation. Especially in the case of more expensive media substances, blast cabinets that recycle blast media are a major factor in maintaining cost-effectiveness for media blasting companies. Sandblast Cabinets - Midwest Finishing Systems, Inc.